"Two or three years from now, every public relations firm that wants to be taken seriously in the C-suite and/or a lead marketing role will have someone like Marshall in its senior leadership ranks, a chief analytics officer responsible for ensuring that account leaders think more deeply about analytics and that thfirm works with the best available outside suppliers to integrate analytics appropriately." --Paul Holmes, "The Holmes Report"
"Marshall has provided much-needed discipline to our newest marketing frontier--a territory full of outlaws, medicine men, dot com tumbleweeds, and snake oil." "Marshall Sponder stands apart from the crowd with this work. His case study approach, borne of real-world experience, provides the expert and the amateur alike with bibliography, tools, links, and examples to shortcut the path to bedrock successes. This is a reference work for anyone who wants to explore the potential of social networks." "Marshall is a solutions design genius of unparalleled knowledge and acumen, and when he applies himself to the business of social media, the result is a timely and important commentary on the state of research capabilities for social media." Practically overnight, social media has become a critical tool for every marketing objective--from outreach and customer relations to branding and crisis management. For the most part, however, the data collected through social media is just that: data. It usually seems to hold little or no meaning on which to base business decisions. But the meaning is there . . . "if" you're applying the right systems and know how to use them. Filled with in-depth case studies from a range of industries, along with detailed reviews of several social-monitoring platforms, "Social Media Analytics" takes you beyond "up-to-date" and leads you well into the future--and far ahead of your competition. You will learn how to use the most sophisticated methods yet known to find customers, create relevant content (and track it), mash up data from disparate sources, and much more. Sponder concludes with an insightful look at where the field will likely be going during the next few years. 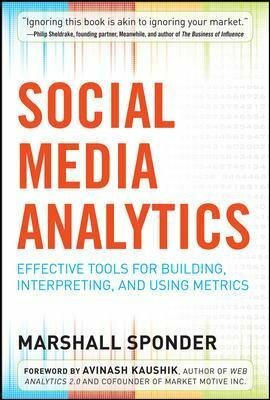 Whether your social media marketing efforts are directed at B2B, B2C, C2C, nonprofit, corporate, or public sector aims, take them to the next step with the techniques, strategies, and methods in "Social Media Analytics"--the most in-depth, forward-looking book on the subject.